Abuse of and addiction to prescription amphetamines/stimulants is becoming more and more common. Here, Addiction Helper provide you with the facts on prescription amphetamine abuse and the most common brand names – Ritalin and Adderall. We will help you understand why these medicines are prescribed and the potential reasons an individual would choose to abuse them. Discover the dangers of abusing Ritalin and Adderall, how individuals are able to obtain these medications without an official medical diagnosis or prescription, the various methods used to get high on prescription amphetamines, how you can tell if there is a potential problem or dependence, and most importantly, how Addiction Helper can help you or a loved one to access the correct treatment and support for your individual problem and circumstances. Abuse and addiction of prescription stimulants can be very dangerous and even fatal. If you or a loved one have a problem, or any concerns, relating to the use of Ritalin, Adderall, or similar prescription stimulants, please call our helpline now for fast, free, and expert help and advice! 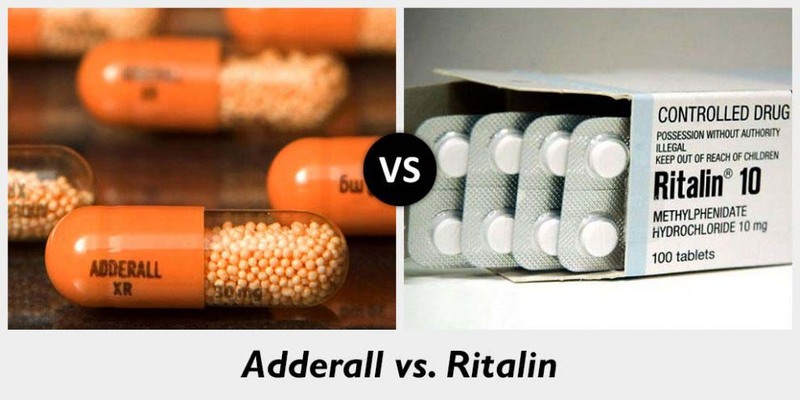 What Are Ritalin & Adderall? Prescribed amphetamines and stimulants are known by the common brand names, Ritalin and Adderall are great examples of the effects and harms of such medicines. Their chemical compound names are Methylphenidate (Ritalin) and Amphetamine/ dextroamphetamine (Adderall). Although they are both used to treat the same conditions, and work in similar ways, there are subtle differences between the two ‘brands’. Both are prescribed for the long-term treatment of medical conditions such as ADHD and Narcolepsy. Ritalin is shorter-acting and works faster than Adderall. Adderall has a longer peak pharmaceutical effect. These medicines are usually prescribed to children and sometimes even adults that have a confirmed diagnosis of ADHD or Narcolepsy. Ritalin and Adderall are very effective in treating both conditions when taken as prescribed. Although the two conditions present very different symptoms. Both Ritalin and Adderall have a great potential for abuse and to lead to addiction; we will tell you more about this further on in this article. Ritalin and Adderall are both controlled medications, scheduled as Class B substances under the Substance Misuse Act. This means that it is illegal to possess, supply, sell, or give it away. For it to be legal and in your possession, it must be a prescribed medication that is prescribed only for you. Their effects, when abused or used by someone without a diagnosed medical condition, are similar to that of cocaine! 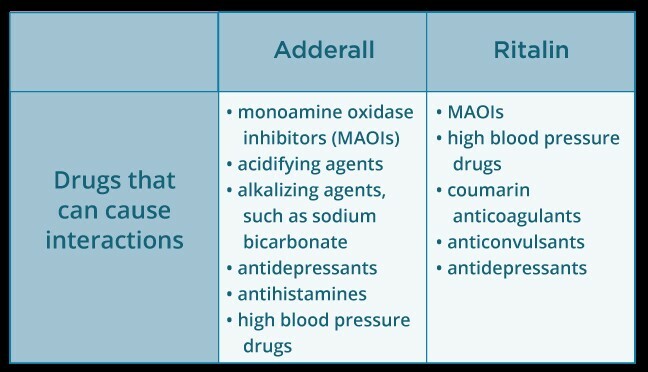 How Ritalin and Adderall and Other ADHD Medications Work? Both Ritalin and Adderall medications work on the central nervous system (CNS) and are central nervous system stimulants. They work by increasing the availability of neurotransmitters norepinephrine and dopamine in the individual’s CNS connections. This results in the brain’s activity being increased, focused, and quickened. Ritalin’s onset is quicker and reaches peak performance sooner than Adderall. However, Adderall stays active in the body for a longer period of time, usually for 4-6 hours, whereas Ritalin is only active for 2-3 hours. 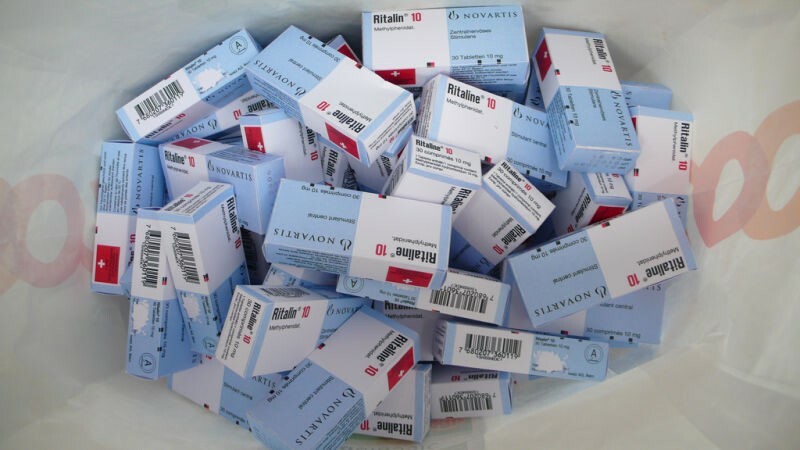 Many will opt for Ritalin as it is shorter-acting and therefore less likely to interfere with sleep. Those that just want to take one dose a day are more likely opt for a dosage of Adderall, such as during school or work hours. If you or your child are being prescribed Ritalin or Adderall, or are abusing it, it is wise to take the following into consideration and discuss with your GP or a medical professional. Ritalin and Adderall work in those with ADHD by providing them with the capacity to concentrate for longer periods of time with clarity and alertness, decrease impulsiveness, increased listening performance, and focus skills, improved organisational skills and help to overcome and control behavioural problems. They help narcoleptics in much the same way, but also assist them in staying awake and alert. The dosage prescribed will be dependent on the severity of the condition. Both have a great potential to be misused, abused, and become addicted to, due to the effects and the euphoric feelings that are produced, especially when misused. Sometimes, these medications are prescribed for severe clinical depression where other medications and methods of treatment have failed to work. The increase in dopamine available in the brain is what is responsible for the euphoric-like effects. When abused or misused, these euphoric high-like effects are increased. Stimulant medications are the most commonly prescribed drugs for ADHD in children. They’ve been used for more than 50 years. In children with ADHD, they have a calming effect and their peak pharmaceutical effects can last anything from 3 to 12 hours. Non-stimulants are also available, these medications are sometimes used as an alternative or in conjunction with a prescribed stimulant. The first prescribed non-stimulant medication for ADHD was approved in 2003. Non-stimulant medications may have fewer side effects than stimulants do, they can also last for up to 24 hours. Strattera carries a black-box warning because studies show that children and teens who take it are slightly more likely to develop suicidal thoughts. There is a huge risk of children who are diagnosed with ADHD and prescribed Ritalin or Adderall to go on to become addicted to prescribed stimulants as well as to illicit stimulants. Being exposed to such a strong medication at an early age puts them in the at risk group of developing and addiction or abuse problem in the long term. They are also learning that pills fix troubled behaviour and feelings, as opposed to therapeutic means. Students have also been known to illicitly obtain Ritalin and Adderall to increase their performance and productivity by keeping them awake and alert for long periods of time. There is a huge potential for them to overdose, especially when feeling under pressure or if they mix them with other drugs. More and more individuals are misusing Ritalin that is not prescribed for them, for the purposes of enhanced performance at work, staying awake longer, to lose weight, or to get high. 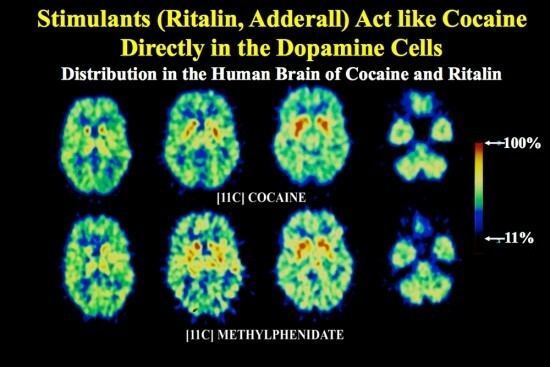 When crushed and snorted Ritalin produces very similar effects to that of cocaine. 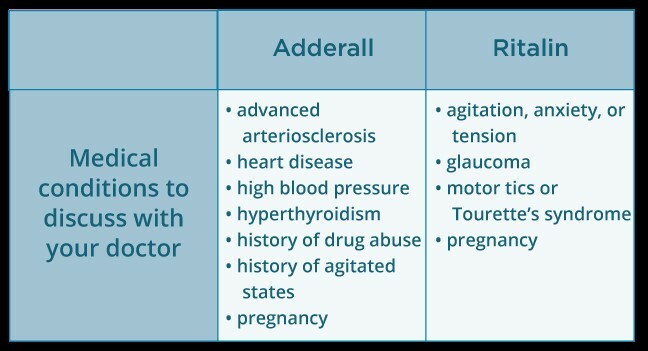 Adderall can produce similar effects when misused in the same way. Some will even dissolve into a solution and inject to obtain similar effects to that of crack cocaine but that are longer lasting. Some individuals will use Ritalin or Adderall for the specific purpose of getting high. They may buy the medication from the internet, street dealers, or even resort to stealing their own children’s medication and from friends. Stress and pressure in working environment are also causes for using these stimulants. Those working shift patterns or long hours, may resort to using these medications to help them to stay awake and alert for extended periods of time. Typical jobs that are high-pressured include: management, on-call, shift works, office jobs that can be mundane yet stressful, and also creative positions relating to deadlines. It is not only those that have stress and pressure in their workplace that may resort to abusing prescribed amphetamines: homemakers, mothers, and fathers who are overtired and stressed out may also illicitly take the medication to help them “stay on top” of things or as a pick-me-up after a heavy weekend on a drink or drugs binge. Regular Ritalin and Adderall use can lead to dependency and addiction; this is where your brain and body will need the drug in order to function and avoid withdrawal symptoms. Even if you are prescribed either of these two medications, you should not stop taking them without consulting your doctor first, with regards to tapering off regime. As Adderall is an amphetamine, the side effects tend to be more pronounced and serious, whereas Ritalin has fewer side effects and therefore tends to be the preferred choice. It is normal for new patients who are prescribed either of these medications, or any other commonly prescribed ADHD medications, to be monitored very carefully by their doctor, especially in the early weeks and months of treatment commencing. If you think you or a loved one may have an addiction or dependence to Ritalin or Adderall, it is very important that you seek professional addiction or medical advice first. Addiction Helper can advise on the safest routes to treating a dependency to these medications, so please call us now talk to us via live chat for immediate, free and expert addiction treatment advice! Teenagers and young adults of college age fall for the false belief that ADHD prescription stimulants make you smarter through cognitive enhancement and performance. Whilst medications such a Ritalin and Adderall do make you more alert and focused, they only enhance learning ability in those that suffer from confirmed ADHD. They can have the adverse effect on an individual who does not have ADHD, in that they are more susceptible to manic episodes and other undesired side effects. There is also more chance of them burning out and crashing. Once the effects wear off they will be overcome with tiredness and the desire to sleep. This can quickly lead to addiction, if they choose to continue taking the medication just to stay awake. “As college students across the country cram for their finals this week, many will turn to the use of “study drugs” to get through the stresses of exams. Prescription drugs such as Ritalin, Adderall and Vyvanse are stimulants that are frequently prescribed to treat those diagnosed with attention-deficit hyperactivity disorder (ADHD). Often referred to as “study” or “focus drugs,” the misuse or abuse of these prescription stimulants have become commonplace for students during the school year. 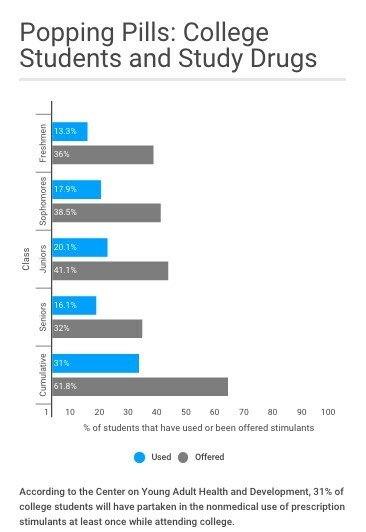 In fact, according to the Center on Young Adult Health and Development, nearly one-third of college students have participated in the misuse of stimulant prescription drugs at least once while attending college. Dr. Bill Ritchey, executive director of health and counseling at Christopher Newport University, believes finals week is a “perfect storm of stress” that leads to the increase in the misuse and abuse of prescription drugs. 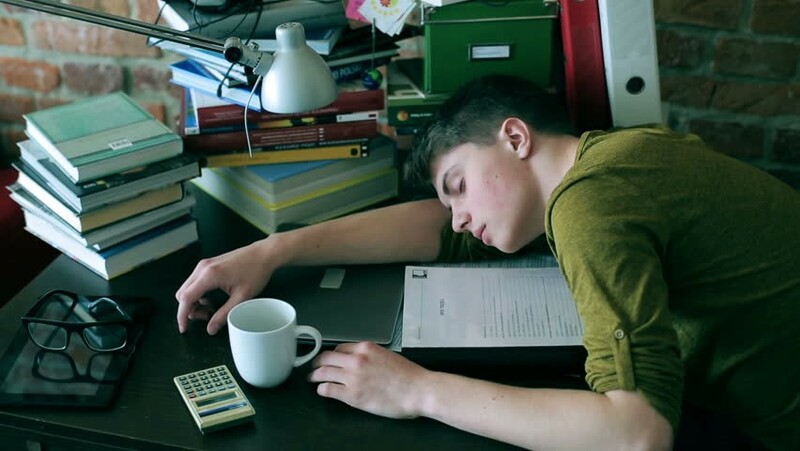 “December is a very stressful time period of the year for students. During finals, we all know that stress levels increase significantly and students will look for any edge to get ahead,” Ritchey tells USA TODAY College. Furthermore, The Centre of Young Adult Health and Development, released the following infographic to demonstrate their statistical findings in their research surveys. 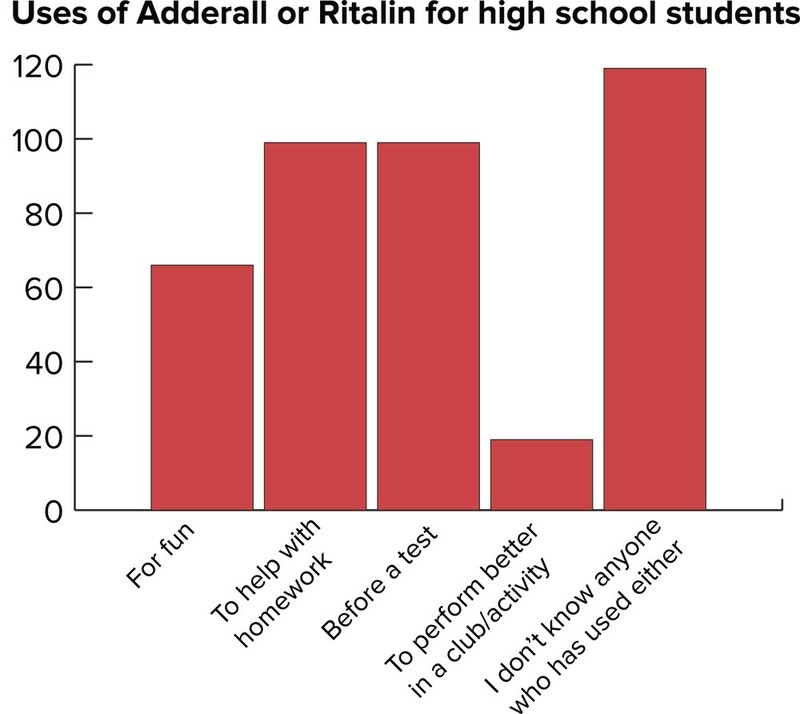 The findings demonstrate that prescription stimulants such as Ritalin and Adderall are widely available to students, and that many are bowing to the pressure of studies and peers and taking them. 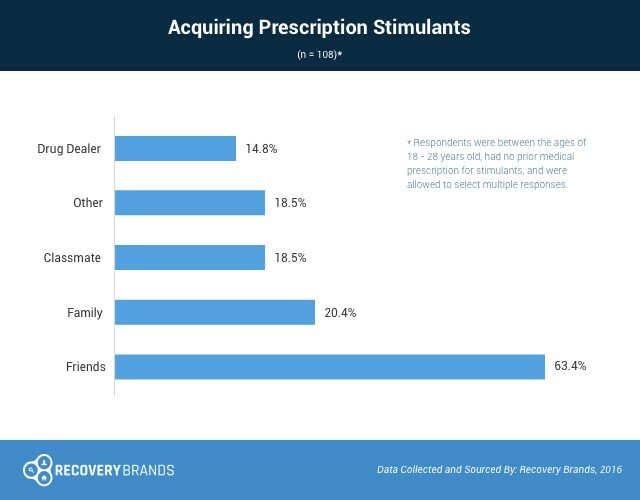 The below infographic, demonstrates that by far the most popular way of obtaining prescription stimulant drugs such as Ritalin and Adderall is through friends, family, and classmates. This would tie in with college student use in the US where many students were offered the medications, rather than having to go out and seek or buy it for themselves. For an individual that is feeling the stress and pressure of meeting exam deadline and revision this can be too much of a temptation to pass up and seem like an ideal solution to their immediate problem. Atomoxetine goes under the brand name of Strattera. Methylphenidate goes under the common brand name of Ritalin. Dexamphetamine goes under the common brand name of Adderall, and Modafinil goes under the common brand name of Provigil. 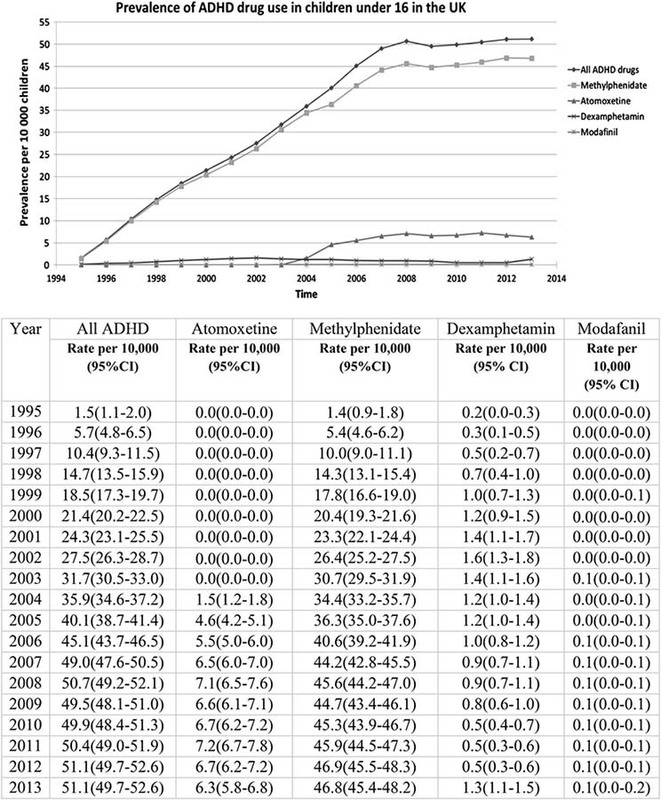 As you can see from the above charts, the biggest increase in prescribed ADHD drugs is for Ritalin, which over the years has almost doubled in it prescription distribution. Overall, ADHD drugs are more commonly prescribed than ever before, which begs the question why? Are more and more behavioural problems that could be treated appropriately through therapeutic routes being addressed through stimulant medication instead? The charts would indicate that this is the case and that parents are seeing these medications as an easy answer to behavioural problems in their children. By heavily medicating a child during their developmental years, they are learning that there is a quick-fix solution in pill form and not dealing with the underlying issues that are the cause of the problems. This same rationalisation applies to an addict’s thinking and approach to dealing with their feelings, emotions, and problems. This is a major cause for concern, as it could potentially be creating addicts from a young age. Any marked change in behaviour or appearance should not be ignored, the above list is not definitive. 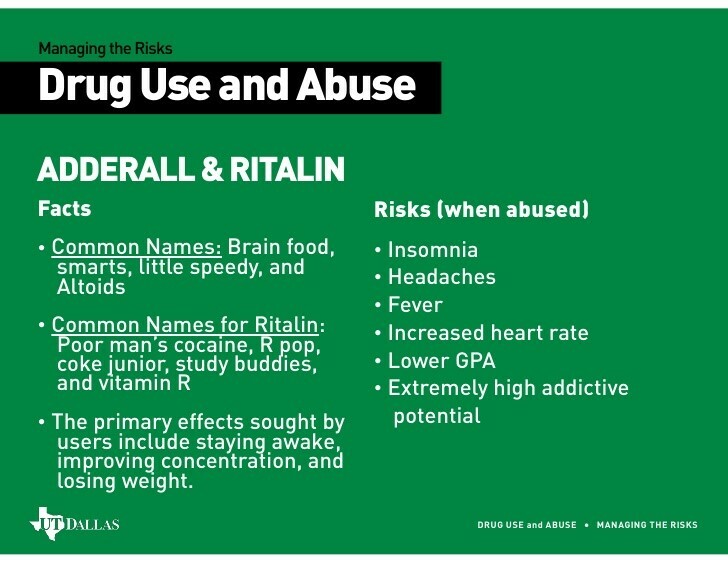 Abuse and addiction to Ritalin or Adderall are very dangerous and can be life threatening. If you recognise these symptoms in yourself or a loved one, it is very important to seek appropriate help and treatment as a matter of priority. Please call us or chat to us LIVE online now for free, confidential, and expert advice on the best addiction treatment options available for your personal circumstances. Now that you have the facts on Ritalin and Adderall, you will be able to make an informed decision as to whether you or a loved one need help or want help. Not everyone that abuses, misuses, or is addicted to prescription medications, alcohol or drugs wants help. If you or a loved one do want help, we can advise you of all of the treatment options available that are most likely to prove successful, both here in the UK and Overseas. What Are the Treatment Options for Prescribed Amphetamine Addiction? If you or someone you love is struggling with ADHD prescribed amphetamines right now, the first step in the treatment process is to assess the seriousness and severity of the problem. Someone in the earliest stages of drug misuse or abuse may not yet be physically addicted but still require medical intervention before the problem spirals out of control. Those who are addicted, absolutely will need immediate professional treatment both medically and psychologically in order to get well. There is little available in terms of treatment available on the NHS for Ritalin and Adderall addiction; at best you can access your local drug and alcohol team for support, but usually the government does not fund inpatient rehab for those addicted to amphetamines or prescription medications. Support groups such as SMART or Narcotics Anonymous are usually the most helpful alternatives to inpatient treatment and can also be accessed as a means of continuing recovery once more intensive inpatient treatment has been completed. But you will not be able to access the professional treatment nor the levels of treatment intensity and expertise that you would receive in a private addiction rehab clinic. NHS community treatment and support is rarely intensive enough to help an individual with a chronic abuse or addiction problem. Addiction Helper understand that loving an addict is extremely painful. Addiction can tear apart families and leave loved ones feeling guilty, resentful, and powerless. 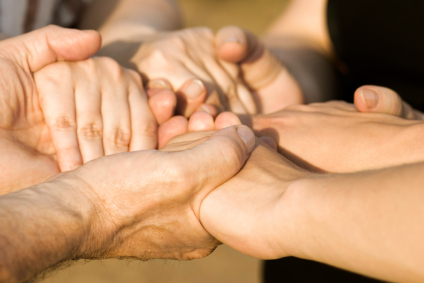 We believe that the family’s recovery is a vital component to assist the individual addict in getting and staying well. It is also vital to freeing the family from the constant stress, worry, and pain of their loved one’s illness. Many of our private rehabs offer a Family Programme for those that are receiving treatment on an inpatient basis. The Family Programme is aimed at assisting the family to heal and move forward from the past. Please speak to us if this is something that you are interested in. Addiction is a progressive illness and will only ever get worse overtime. You or your loved one can get well; your family can get back to those days before drugs became a problem, and we can help you to achieve this. There are many organisations that also offer free, charitable support to those that are affected by another’s addiction, please click on the following links: Adfam and Families Anonymous. Addiction Helper specialise in inpatient detox and rehabilitation. We devise bespoke treatment plans, based on the individual’s specific treatment requirements, circumstances and needs. We have access to over 100 UK addiction rehab centres and some elite treatment centres abroad. By calling us, you will receive a free, non-committal comprehensive assessment, carried out by one of our highly trained and experienced addiction treatment experts. From there, we can advise you on the best treatment options available to help you or your loved one find permanent recovery from the likes of Ritalin and Adderall addiction. The preferred treatment option for prescribed amphetamine addiction is inpatient detox and rehabilitation. The temptation is immediately removed, as the patient is placed in a supportive, non-judgemental and recovery-focused environment. Treatment for ADHD medication addiction is very similar to that of amphetamine addiction and ideally begins with a full medical detox in a medically supervised rehab clinic. Detox is necessary where an individual has developed a physical dependency to the drug. The withdrawal dependency symptoms related to these types of prescribed amphetamines can be severe to the point of creating a dangerous and life-threatening situation. Attempting to detox by oneself can result in serious injury or even death. Undergoing a full detox under medical supervision offers the added benefit of approved detox prescription medications that can really help to relieve the withdrawal symptoms. Medically, it has been proven to be the safest and most successful way to withdraw from prescription amphetamine addiction and dependency. Approved medications will be prescribed by one of our qualified and experienced rehab doctors, to help patients better cope with the physical symptoms as well as any psychological symptoms such as anxiety, panic, or depression. We will ensure the individual’s safety throughout this process with 24/7 care and support. Once detox is complete, usually in about 7 to 10 days, dependent on the severity of the dependence, the patient should then immediately undertake a full and comprehensive therapeutic rehab programme designed to teach the individual about his or her addiction and treat the underlying psychological issues that trigger addictive and compulsive, maladaptive behaviours. Our addiction rehabs also comprehensively treat dual diagnosis patients – those with more than one addiction and those with co-occurring illnesses such as trauma, depression, anxiety disorder, eating disorders, PTSD and obsessive compulsive disorders. Before beginning rehab therapy, the prescription amphetamine addict needs to understand that relapse rates for this particular class of drugs are extremely high, due to the nature of the illness and availability of the drug. Those who truly want to get well, will have to commit themselves to treatment, give a 100% effort, and be dedicated to follow-up treatments and support once residential rehab has been completed. Addiction cannot be cured! However, with the correct treatment it can be successfully arrested and recovery maintained from there. Freedom from addiction to Ritalin, Adderall and other prescribed ADHD medications is 100% achievable; call us now to find out more and take that first step to a brand new life free from addiction!